The season's hottest accessory, caught on film! She sings. She acts. She has her own theme park. Her wigs and her breasts are the stuff of legend. She is, obviously, DOLLY PARTON. We here at Glam adore the Dolly One, and we are thrilled to see her sporting some hot hot hot accessories this season. Here she is decked out in some sextastic glasses and THE LITTLE ENGINE THAT COULD--with her suit color-coordinated to the engine. Dolly's just TOO stylish for words. 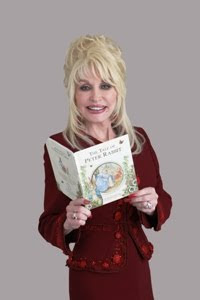 Here at Glam Book Shots, we collect pictures of celebrities with the season's hottest accessory: BOOKS! We are always on the prowl for new photos, so email us at glambookshots at gmail dot com to submit yours! Bibliophiles who love a hot book and hot people. We are dedicated to bringing you book sightings from around the globe. triple the fun--but where's pokey?